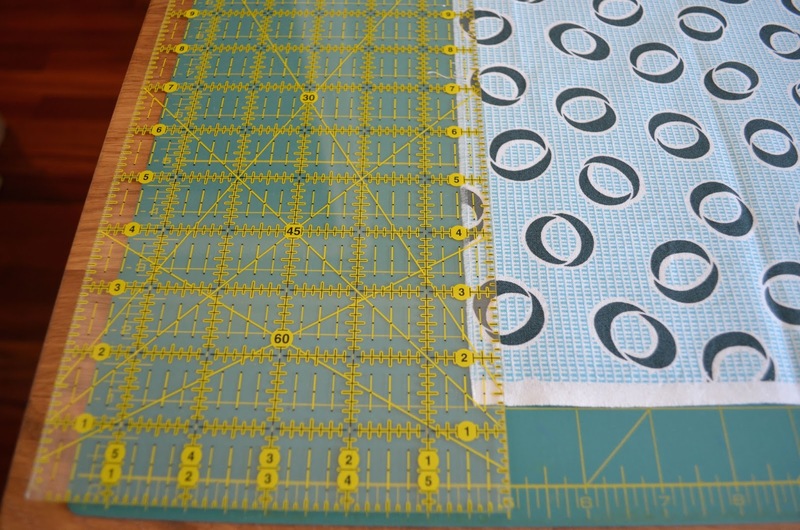 We are going to start the Decipher Your Quilt series today by discussing Accurate Cutting and Seam Allowances. In the survey answers, the question of how to achieve and maintain accuracy in these areas was asked many times. Both Jess, who blogs at the Elven Garden, and I will ramble on about how we cut and determine our seam allowances, so please also head over to read Jess's post too. Accurately measured pieces. Almost all quilt blocks (except improv blocks) are designed with a geometric plan that involves precise measurements of the parts of the block. If the pieces of fabric are not accurately measured to match the plan, they cannot easily - and often cannot ever - be assembled to match those precise measurements. Bias stretch. Fabric, by its nature, can stretch and it stretches and is distorted more easily if it is not cut on the grain and instead is cut on the bias or partly on the bias. Uneven strips. If you cut long strips from badly folded pieces of fabric, the strips will not have straight or parallel sides and smaller pieces cut from those strips will not all be the same. 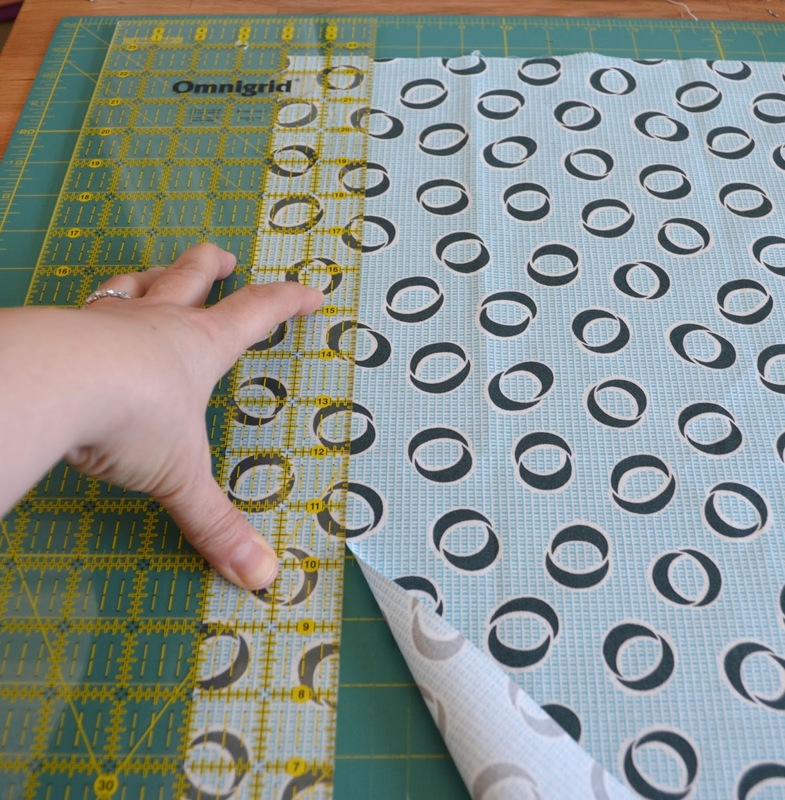 There are many correct ways to cut fabric for quilting. I am going to show you how I cut fabric, but if you have a method that works for you please do not feel you need to make changes. Just use what makes sense to you from my approach. 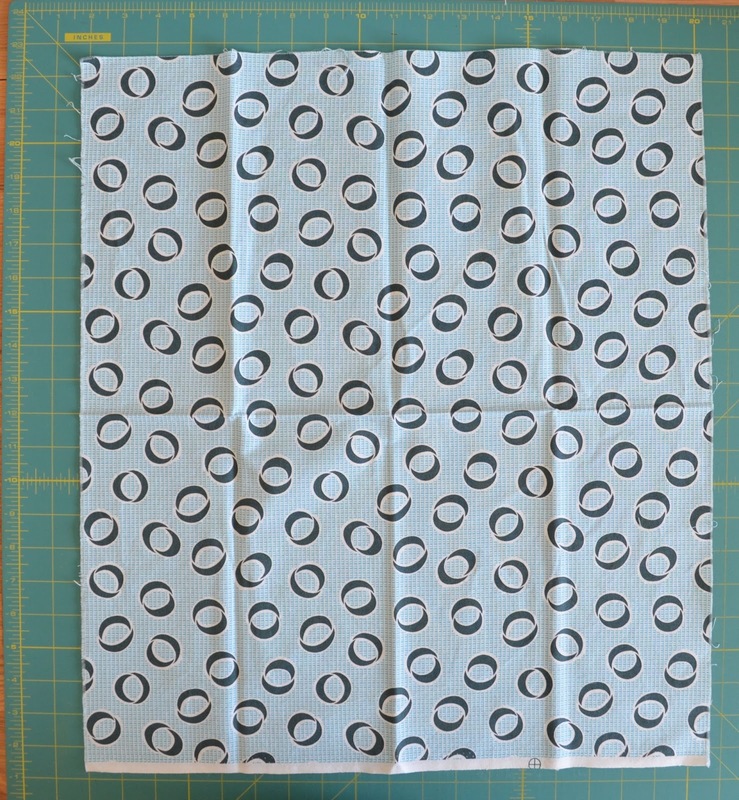 I am going to demonstrate with a fat quarter, but this approach will work for most any larger size of fabric piece. At the end I will give you some tips for working with scraps. There are even different approaches to folding and storing fabric. I fold my fat quarters like this, with one fold in half parallel to the selvage edge, then in half and in half again. I find this size fits nicely on my shelving. It is best to unfold and press the fat quarter before cutting it. You can see how the fold lines are not precise and they distort the fabric. However, I admit to often skipping the pressing step. 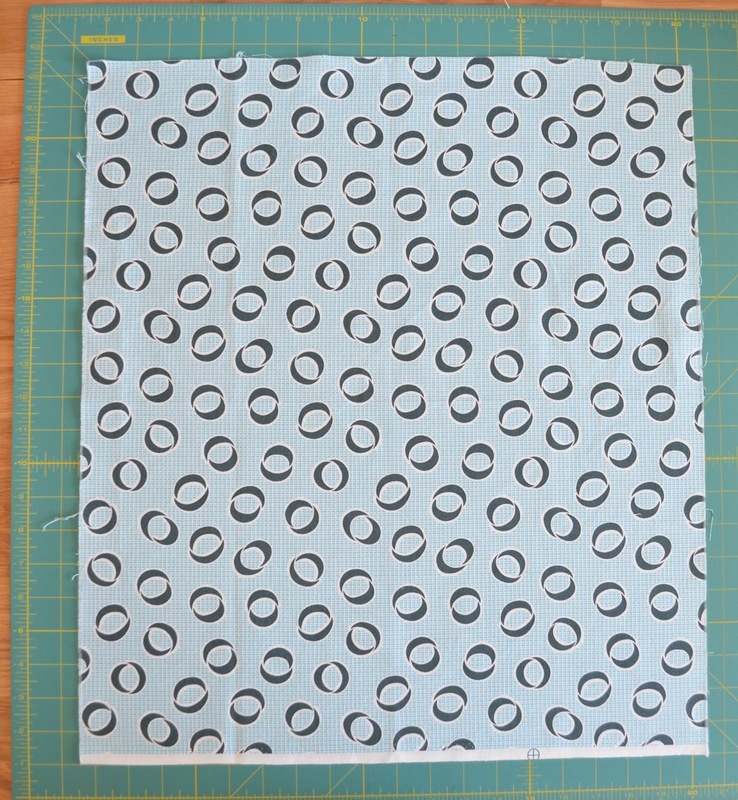 I try to cut fat quarters with the fabric flat like this instead of folded if I have space on my cutting table to do so. I lay the selvage edge along one of the lines of my cutting mat. By the way, this is one of the reasons that I don't cut off the selvages of my fabrics early. Before I cut the fabric, I take a good look at the edges of my fabric to see if the fabric was cut along the grain line of the fabric or not. Remember that cotton is an even weave fabric where each weft thread is woven over and under each warp thread evenly to achieve a smooth fabric (as opposed to other weaves, for example, like a twill weave that you see in denim). If the fabric has been cut exactly on the grain, you can pull out a thread and it will easily pull off all the way up the cut. This photo is of the edge closer to the top (and rotated counterclockwise). You can see that at the corner the fabric is no longer cut exactly along the grain. Fat quarters are often, in my experience, not cut along the straight of the grain. I notice it more than many people because I pre-wash my fabrics. The washing and drying process generally returns the position of the warp and weft threads to their original orientation perpendicular to each other and it takes any stretching that happened on the bolt out of the fabric, returning it to a nice even weave. However, that also reveals inaccurate cutting of the fat quarters. I want to emphasize, I see this happen with fat quarters (or other size pieces of fabric) cut by all good fabric shops and also on pre-cuts straight from the manufacturers. Fabric stretches on the bolt and it is not easy for a person cutting it before it is washed to notice these small inaccuracies. Part of accurate cutting is to accept this as normal and cut off the waste. The first cut off the fat quarter is to clean up the uneven side edge. I line my quilter's ruler up with the measurements on my cutting mat so that they match exactly while having the selvage edge of the fabric even with a line on my cutting mat. 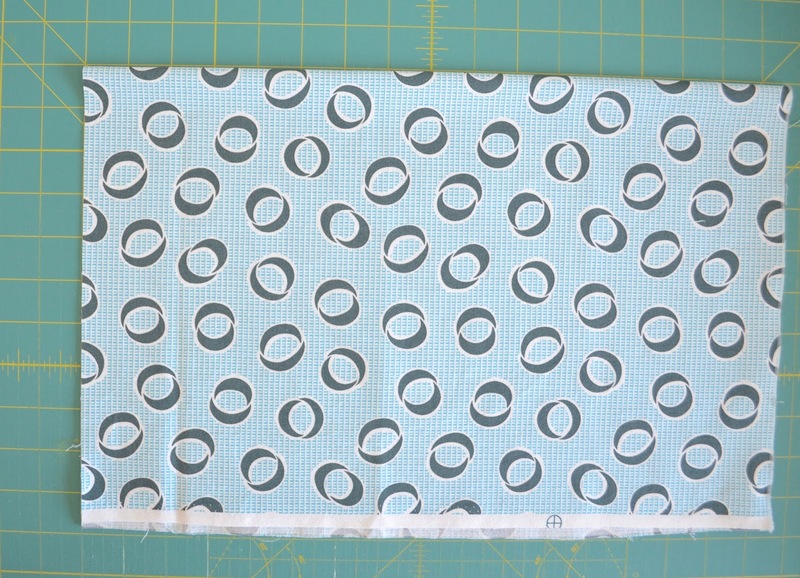 Dear Jess and Leanne: What is the most accurate way to cut my fabric – using my cutting mat, or my rulers? I use both together as shown above. Both your ruler and your mat can warp if you store them incorrectly or leave them in the sun. I work on the assumption if they match each other exactly, they are both accurate. If that match does not occur, I will look to see which is warped, the mat or the ruler and replace it. Once I have the ruler lined up with the marks on the cutting mat, I cut off a small strip off the edge of the fat quarter to return the edge as close as I can manage to the grain line (the line that the weft threads create) of the fabric. To cut a strip of fabric, I again line up the fabric as shown, now using the selvage edge and the cleanly cut left edge to line up with lines on the mat. The strip I am cutting is 2" wide and you can see how the ruler is measuring the fabric to be cut off by sitting on top of that piece. Also notice that every line on the ruler matches with the lines on the mat, so I know it is perfectly alighted before the cut. Always look to the top of the ruler too to make sure that the alignment has not tipped a bit at the top of the ruler. Perfect alignment here is the key to a perfect cut. 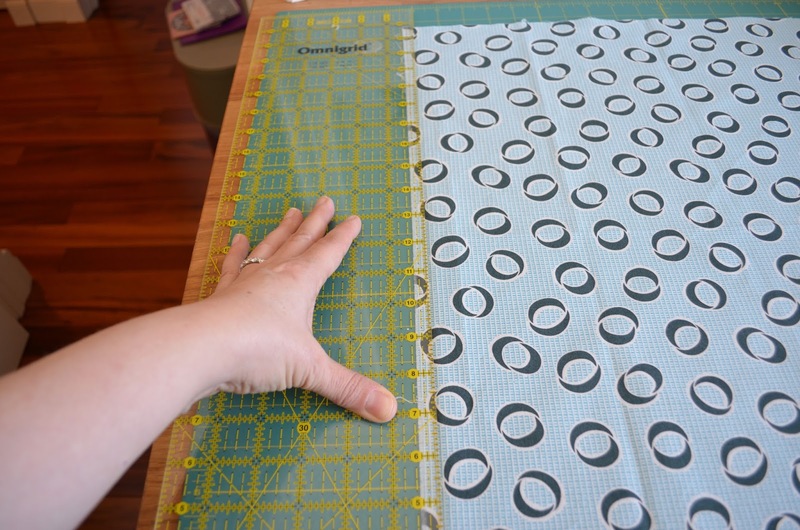 If you are left handed, you will want to reverse this approach so that you are cutting off the right side of the fabric and using your right hand to steady the ruler. 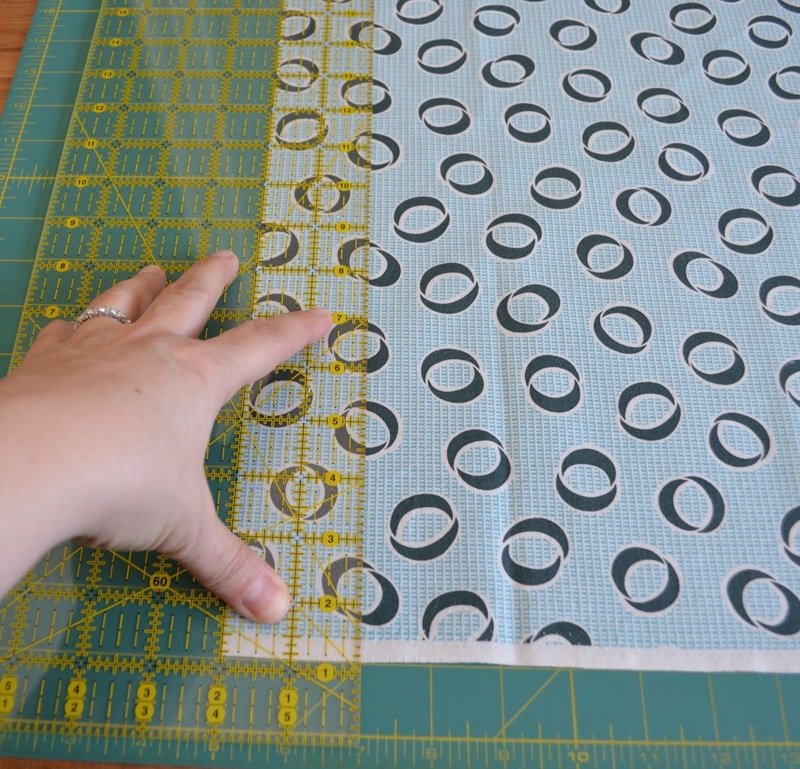 Once the ruler and fabric are properly aligned from the bottom to top of both the ruler and the fabric, hold the ruler as shown in the bottom 1/3 of the ruler and cut just to the top of where your fingers are steadying the ruler with your rotary cutter. If you cut past your hand, it is easy for the pressure of the rotary cutter to push the ruler out of line which will make your cut uneven. Lift your steadying hand and move it up the ruler, ensure that the fabric and ruler remain lined up (if not, reposition everything) and cut again to the top of your steadying hand. Repeat until you get to the end of your fabric. When I cut smaller pieces I use exactly the same technique. I position the smaller piece or strip or whatever along a line on the mat. I then align my ruler so that the piece I am cutting off is under the ruler, and that ruler is lined up with all the markings on the mat that it covers, top to bottom. Then I cut. Once I have cut the first tidying up cut off the edge of a fat quarter I often fold it in half as shown and cut it folded. If the edges - for me as a right handed person I cut from the left edge, remember if you are left handed you will be cutting from the right edge - have been cut straight, I then fold the top of the fat quarter to the selvage edge and line up the straightly cut edges and then use those two lines to cut from. Dear Jess and Leanne: I find it difficult to square up yardage before cutting it into strips, especially in cases where the selvedges don’t meet up through the whole piece of fabric. For selvage to selvage yardage, I fold the fabric selvage to selvage and line up the selvages before I make the first tidying cut. I hold the fabric up with my hands holding the selvages and slide one edge back and forth until I get the fabric to drape without folds and that is where I keep the selvages as I put the fabric on the mat for the first cleaning up cut. If I have a long piece of yardage and want to keep it long, say to make a quilt back, I just make sure that the fabric is lying flat on with selvages together near the edge I need to cut and leave a bunched up bit of fabric on the far edge of the cutting table. The fact is that the larger the piece of fabric, the harder it will be to get the selvages to lie together nice and flat for the entire cut of yardage. The fabric stretches on the bolt. If you have a piece of fabric that is really off, consider pre-washing as that is the best way to get the warp and weft threads to unstretch and return to their even weave. You can also give the fabric firm tugs on the bias line which is corner to corner as this also coaxes the warp and weft back into their proper alignment. For cutting small pieces and scraps, I try to line up the piece so that one of the warp or weft threads is roughly following a line on my mat and then I cut the scrap as best I can. Bias cuts: Be careful when you are cutting triangles, circles/curves, or other angles. 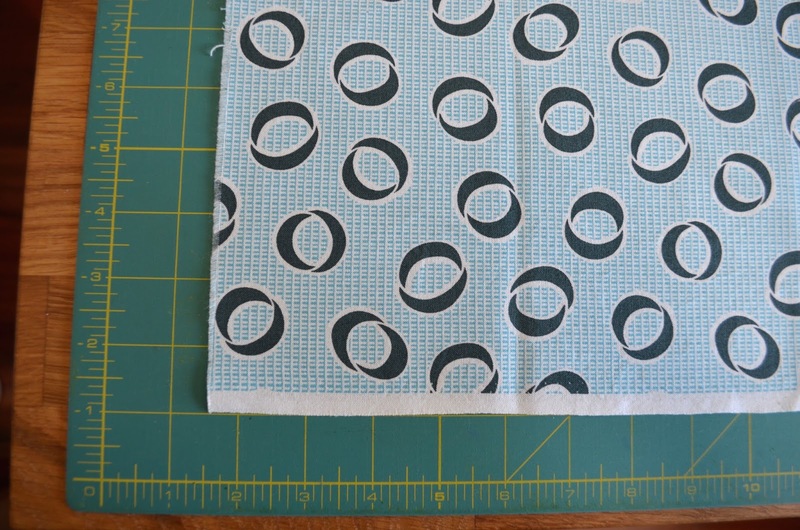 When you cut along the bias of the fabric your cut piece will easily stretch to another size just from handling it and pulling on it as you sew. Handle these cuts carefully as you put them on your design wall or into a box waiting to be sewn. I try cut and sew these kind of pieces rather than cut a great number and then sew them later. If you have handled the pieces a lot, do measure them and if they have stretched a lot, consider recutting new pieces as trying to get the stretched fabrics to fit into your blocks is hard. The math for the block presumes accurately cut fabric pieces. Don't cut fabric when you are tired or distracted: In addition to the risk of nipping a finger tip, I often end up with sloppy cuts if I am tired when I cut. The aggravation caused when I piece those fabrics is not worth it. Put the cutting off until you are rested and attentive to the cutting. Lastly, seam allowances. I am going to cheat on this part of today's post and paste in a tutorial I wrote last November. This tutorial shows one way to check your seam allowances that works nicely for me. 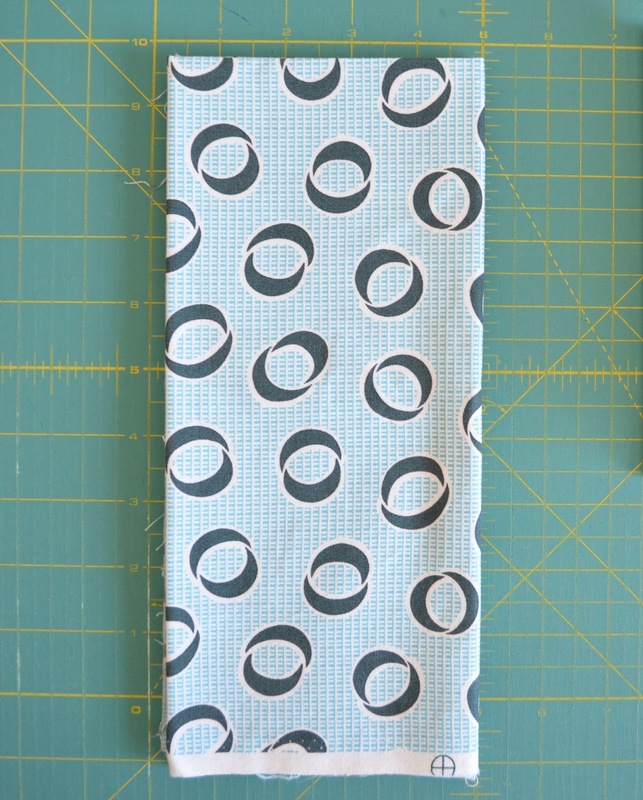 Another way is to cut two 3" squares of fabric and sew them together using your 1/4" seam allowance. Press. Measure the resulting unit which should now be 3" x 5.5". If it is larger, then you need to try again making your seam allowance a smidge larger. If the resulting unit is smaller than 3" x 5.5" you need to try again making your seam allowance a smidge smaller. Repeat until your resulting unit is exactly the right size. Amy from Amy's Creative Side has an excellent tutorial for this method here. This idea is not mine, I have read it and heard it several places. Start by drawing a line 1/4" on your paper. Look at the photo, you want the measurement to be scant (a little less than 1/4") to allow for the thickness of your pen line. Set up your machine as you would normally and sew down the line. Here you can see that my machine's default setting it too wide by a smidge. Move the needle over if your machine can do that, or change your sight lines or guide, aiming to put your needle down right into the line. Stitch again and check the result. For my Janome Horizon, I need to set the needle at 4.0 to get a 1/4" seam and 4.5 for a scant 1/4" seam. I find that if I work with a 1/4" seam for quilt blocks, they come out to be the right size and if I use a scant seam they are slightly too big. Well, that is it for today, I hope you have enjoyed my thoughts on Accurate Cutting and Seam Allowances. Do go over to Jess's blog The Elven Garden to read her thoughts on these topics and if you are enjoying the series, please grab our button and join the flickr group by going here. Please post photos of your process using any of the ideas or techniques from the Decipher Your Quilt series in the flickr group or on Instagram or elsewhere with the hashtag #decipheryourquilt. I hope you will let me know if you have found this helpful and if you are finding more accurate cutting helps with your overall quilting success. What a great and thorough post Leanne. I started off cutting my fabric in long strips but more recently started folding and cutting which can lead to wonkiness...I think I'll go back after reading this. Very interesting, Leanne! I think I have finally (after 5 years!) conquered my quarter inch demons largely due to your post in the Autumn. My other big problem seems to be my pressing method. I think I'm too vociferous with my iron! A really useful post. I learnt the hard way for cutting strips I really need to press my fat quarters as I get that wobbly strip thing from where the folds pucker the fabric. Since I've been doing that I've realised how not all FQs are cut equal. Some places cut an exact fq of fabric others are much more generous in one or both directions. Another thing that helps me with keeping the ruler straight is I bought a dent puller from ebay and use it as a ruler handle. I can't seem to get enough pressure on a big ruler with just my hand and I worry about slips with the rotary cutter! What is a dent puller? Great post! A tool I use for cutting long strips is a inexpensive wood clamp. I line up my ruler and then clamp down the far end to my table. I still hold my ruler down at the bottom third and move my hand but the clamp really does all the work at keeping things straight on the far end. Wow. What alot of good info! I know I don't worry about grain line enough, so it's a good reminder! Thank you for such detail. I still seem to have trouble after getting an accurate 1/4 inch seam on my machine because I apparently don't press the seams well. How much of a difference does pressing have on seam size? Is it different on pressed-open seams and pressed-to-the-side seams? Does steam or dry make the difference? If I notice my pressing gets the seams off, should I adjust my piecing or my pressing to accommodate? Very thorough Leanne. Interesting to read that fabrics stretch so much on the bolt. I should probably pay a little more attention to finding the grain properly. Thank you for all the tips. All good points Leanne. I am obsessive presser and finder-of-the-grain when I am cutting fabric, and it always makes me shudder to see people cutting unpressed fabric! I often square up my FQs by folding the selvedge to the cut edge so I get a straight drop, and squaring up as I would a piece of yardage. so much useful information here. I always pre wash my fabric as have been told if one piece has been washed they all need to be, can be a pain in the winter getting them dry. One query re selvedge, sometimes what ever I do they will not line up, feel it is because I have bought inferior fabric and somehow it has been too distorted. Great post! I have to say that I seldom worry about the ruler markings on the mat, only my ruler. I'll have to think about that. I shop at a fabric store notorious for pulling a thread in order to accurately cut the fabric perfectly on the grain. It certainly yields straight pieces but can be time consuming when waiting in line for each fabric to be meticulously cut! Thanks for your great post. I have to ask though... am I the only right handed person who cuts the opposite way that you do? 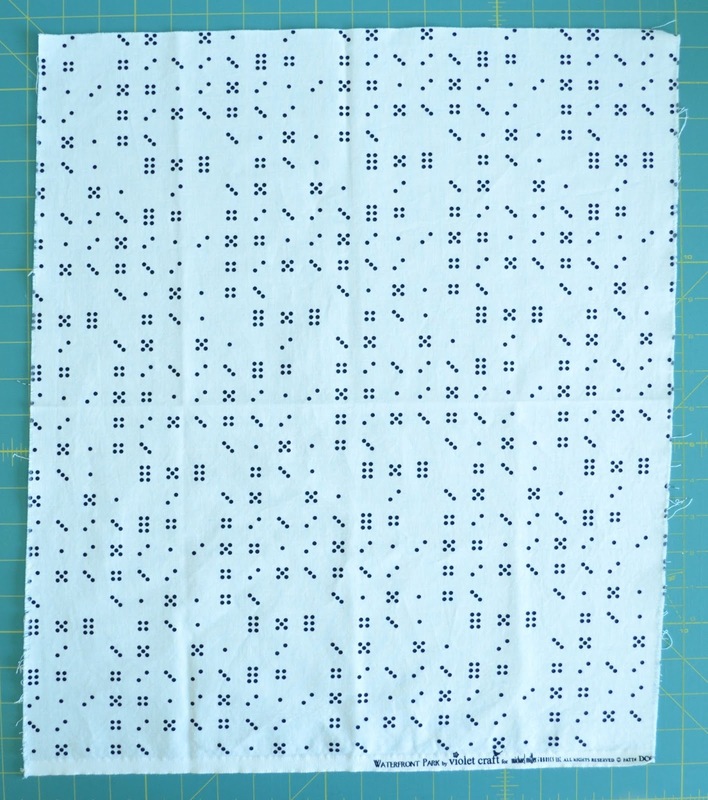 I cut with my 6x24" ruler covering the vast majority of my fabric, so if I'm cutting a two inch wide strip I line up the ruler using another ruler coming in from the right side or using the grid lines on the cutting mat. 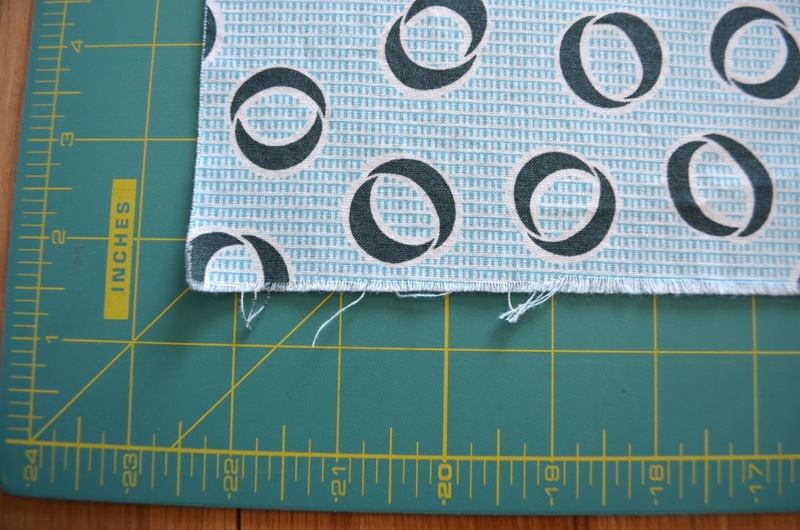 That way, if my rotary cutter slips while cutting I can potentially ruin part of a two inch strip rather than a piece of yardage... And I feel that having the bulk of fabric under the ruler stabilizes it more. I've tried cutting your way but it just m akes me uncomfortable. Curious if anyone else cuts the way I do? Liz You arent alone... I too am the other way around! and right handed. I am "old" and had to cut fabrics way before mats had markings, and rulers were just a strip of perspex....also without markings. I agree.... the weight of the large ruler (to the left) helps stabilise the fabric. You two are doing a great job of covering the essentials. I should probably try harder to really square up my fabric to the grain. I'm pretty accurate though so don't worry too much about it. I certainly could benefit from testing my 1/4" seam more often though. What's next? Thanks for all the fabulous information - I really need to remember that it's so not worth cutting / pinning / sewing when tired! Just wondering if you have any advice for cutting fabric when a design that is meant to be straight has been printed off-the-grain? I'm never sure of the best way to deal with this and it seems to be a problem even with some good quality fabrics. Thanks so much for any help that you can provide! Wonderful post! It's nice to know someone out there also uses the rulers and mat together!! What a great post! I've nodded my way through most of this - the only things I do differently is that I square my fabric up on the right hand side of the fabric (using my ruler - I line the bottom up with one of the horizontal lines to ensure it doesn't run off) and, after trimming, I rotate my board so the straight edge is on the left, ready for cutting. The other thing I do is to cut multiples of a strip, particularly if it's a narrow strip: if I'm cutting 2" strips then I cut an 8" strip (I have an 8.5" x 24.5" Omnigrip ruler - it's relatively new and is the best ruler I've ever used!) and then I move the ruler so the 6" line is on the left hand edge and cut. I then move it back to the 4" line and cut and then to the 2" line and cut. I find that I don't need to square up my cut edge anywhere near as often and it's faster as I don't need to lift and move my ruler as much. It also means I don't try to move my cut strip only to discover that some threads haven't cut (a common occurrence when you're being stingy and trying not to change your blade!) and when I've tried to move the strip I've disturbed the alignment of the rest of the fabric. I'm not sure I've described it very well so I've made a collage of some photos I took ages ago (before I got my wider ruler!) when I was cutting 1.5" strips http://flic.kr/p/kUQBfy. I usually prewash, but I never knew that it helped to straighten the fabric. I have fabric for a quilt back which has been washed and folded for a year, would you recommend washing it again to relax the wrinkles?